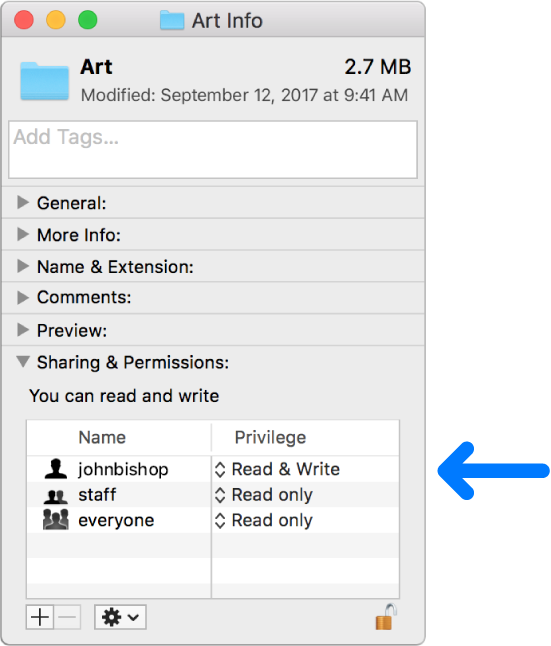 On your Mac, select a disk, folder, or file, then choose File > Get Info. If necessary, click the lock icon to unlock it, then enter an administrator name and password (or, if your Mac has Touch ID, use Touch ID). On your Mac, select a folder or a disk, then choose File > Get Info. Click the lock icon to unlock it, then enter an administrator name and password (or, if your Mac has Touch ID, use Touch ID). On your Mac, select the item, then choose File > Get Info. On your Mac, select an item, then choose File > Get Info. If you don’t own the item, click the lock icon to unlock it, then enter an administrator name and password (or, if your Mac has Touch ID, use Touch ID).